How many Prancing Pony taverns can one world have? 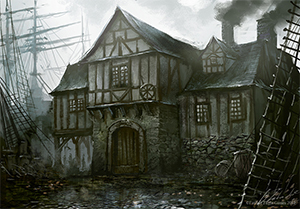 As you and your players jam though the campaign world finding another tavern called, “The Prancing Pony” “Green Dragon” or some other over-used cliche joint, the name can pull away from the believability and uniqueness of the world. Do you cringe when the players ask for the local tavern name? Who’s in there? What’s it like? Location: On Stony Alley, near an outcrop of volcanic rock. Its neighbors include the workshop of a female dwarf woodcarver named Hildga Taridotr and the crumbling ruins of a building. Description: The inn is a sprawling single storey wooden building, with unusually low ceilings. Several battered shields hang on the walls. Accomodations consist of a single large room with wooden cots. Innkeeper: The innkeeper is a tall male halfling named Ancis Balley. Reder Borne: Male Halfling Peasant, Evil. Reder has white hair and hazel eyes, and numerous unusual tattoos. He wears well-made clothing and several small tools hang from his belt. Reder is envious and fiendish. Gili: Male Dwarf Peasant, Neutral. Gili is tall, with silver hair and brown eyes. He wears worn clothing and a wide-brimmed hat. Lida: Female Elf Peasant, Evil. Lida is repulsive in appearance, with tangled brown hair and soft amber eyes. She wears worn clothing and a wide-brimmed hat. Lida has an animal companion, a black-tailed chicken named Mella. Robert: Male Halfling Professional, Good. Robert has short auburn hair and bright brown eyes. He is capable and honorable. Robert seeks a company of adventurers to investigate mysterious lights which appear in the Desolation of Buriashuu. Undil: Male Dwarf Artist, Neutral. Undil has a round face, with thick brown hair and bright blue eyes. He wears modest garments and a dragonscale cloak. That’s fine, but I can’t think of all that on the fly!! Me either, Check out the Random Inn creator from Donjon. Donjon is a wonderful tool box for GMs who game on the fly. You can grab this info, pop it in a document and when the party returns, you can pull out the results and these NPC’s menu items etc will be waiting. In the next town, pop out another tavern for your murder hobos for the folder. You will seem like a genius GM, and no more Prancing Pony taverns! !